Cycling South Africa (CSA) on Friday announced the SA junior women’s team for the UCI Road World Championships in Ponferrada, Spain, from September 21 to 28. African champion Monique Gerber and fellow Bestmed-ASG teammates Catherine Colyn and Michelle Benson will make up the junior female component of the national team. Team manager Owen Botha was pleased by the inclusion of his charges and he was hopeful that they would become the core of the senior women’s team in years to come. Gerber, from Port Elizabeth, has just returned from the UCI Junior Track World Championships in Korea where she focused on the individual pursuit and scratch races. Botha said only Gerber and Benson would participate in the 14km individual time-trial in Spain, which would be the latter’s main goal. According to him, all three riders were entered for the 72.8km road race, which featured two telling ascents on each lap for a total of 1 224 metres of climbing. “Catherine can climb very well, so the course should suit her,” said Botha. In February, Benson and Gerber grabbed gold and silver respectively in the individual time-trial at the national champs. Gerber also claimed the runner-up spot in the road race to add to second place finishes in The Herald VW Cycle Tour and Tour Durban national classics. Benson, who hails from Pretoria, won gold in the time-trial at the African Youth Games in Botswana in May. 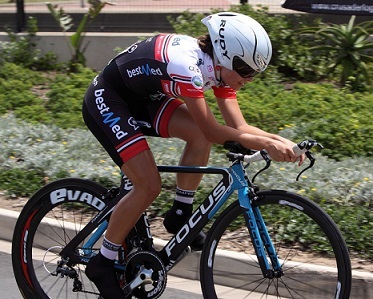 Capetonian Colyn showed her liking for tours by notching up junior victories at the Trac N4 Tour (March), Bestmed Jock Cycle Classique (July) and Lowveld Tour (August).